The diagram below shows the geometry of the model. 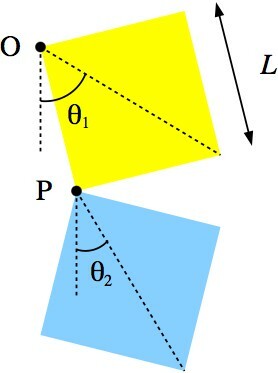 The points O and P are the two pivot points. The pendulum rotates in the plane of the figure. The equations may be rewritten as four coupled first order ODEs, and then numerically solved using standard methods. It is helpful to non-dimensionalise by scaling time in units of the square root of L over g. The C code used to solve the equations is here. The method of integration is fourth order Runge-Kutta. No explicit checking on accuracy is performed, but the energy is calculated at each time step. The equilibrium configurations provide simple checks on the implementation of the equations. The movie on the left below shows the system evolved starting at the stable equilibrium in which the diagonal of the top plate is angled by about 26.6 degrees, and the bottom plate hangs straight down. The movie at right below shows one of the unstable configurations, which is the inverted version of the stable configuration. The numerical solution reveals the instability - the top plate falls down eventually. The device in the School of Physics differs from this simple model in a number of ways. First, there is friction in the axles. Also, the wheel and axle attached to the top plate, and the axle joining the plates are both quite large, so they alter the mass and location of the centre of mass of each plate. Finally, the device in the School of Physics also has the axles located some distance in from the corners of the squares. In principle all of these things could be incorporated into a more detailed model (at the expense of simplicity! ).